Khartag Point is a landmark in the West Gash region of Vvardenfell. It's located northwest of Gnaar Mok and south of Andasreth. It was originally a large rock formation that was made famous when Khartag, an Orc abolitionist and ex-champion of the Daggerfall Covenant, died there circa 2E 582. Khartag and his Orcish gang, "the Ropefish", were based out of the natural tunnels that ran beneath the rock, and worked at smuggling escaped slaves out of Vvardenfell. After a deal between them went sour, the Camonna Tong invaded Khartag Point to wipe out the operation and return the slaves. Khartag succumbed to a poisoned blade within the caves, but the surviving Ropefish continued smuggling escaped slaves in Khartag's name. The Ordinators of Vivec City also sent adventurers to investigate and disrupt the Camonna Tong's slave trading activities at Khartag Point. Parts of the caverns were flooded and overrun with dreugh at the time, which held back the Tong but resulted in the death of a slave. The most powerful dreugh, known as "Old Rust-Eye", was killed by intruding adventurers. Over time, the myth of Khartag seemingly warped, and it was said that he had died at the landmark after a battle. It became something of a monument to the Orcs, and its notoriety increased when another Orc was dared to jump off the cliffside, leading to his own demise. In 3E 427, the Daedra Lord Boethia tasked the Nerevarine with the construction of a new shrine on Vvardenfell. The Nerevarine contracted the Orc sculptor Duma gro-Lag with the construction, and after twenty-one days Duma and his construction crew had transformed Khartag Point into a statue of the Prince. Boethiah rewarded the Nerevarine with the Goldbrand. 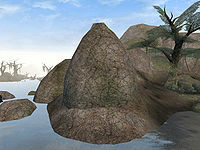 For game-specific information, see the Morrowind and ESO articles. This page was last modified on 13 February 2019, at 19:51.